Nothing gets you off your high of the successful Bike to Work Day Event in Stamford quite like a long, solitary drive up to the one-stoplight town of Red Hook, New York. It is also the kind of town that city dwellers like myself has a tendency to mock from afar but admire and appreciate once you actually visit. I can rest my case on Red Hook's value with the existence of Taste Budd's Cafe, for example, but I'll move on. 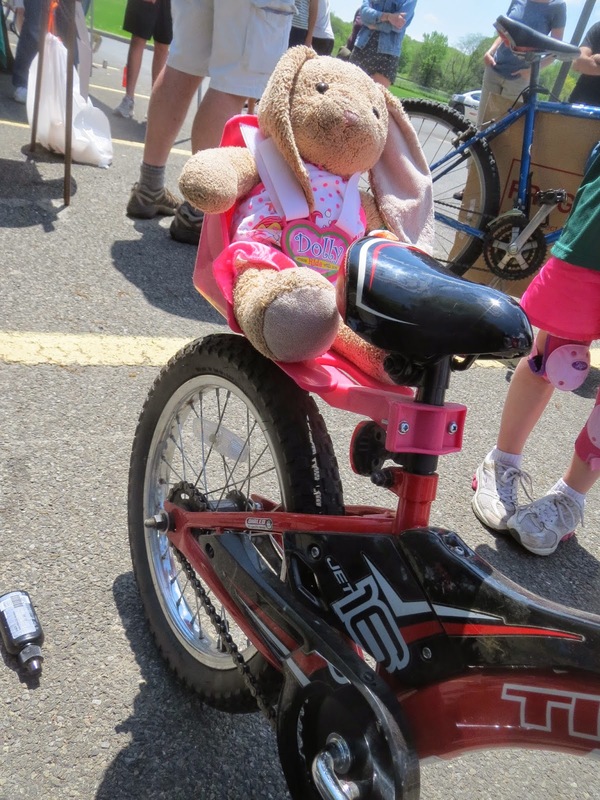 You see, I had promised my older sister - a village trustee for Red Hook Village, which has their own web site and everything - that I would volunteer for my niece and her Girl Scout Troop's Bike Rodeo. I wasn't even sure what it was I had signed up for. I knew I'd be tuning bikes up but unsure of the context, I brought a lot of serious tools with me in the back of my Element. Even though this commitment meant I would be missing Bike Stamford's ride, I knew I'd be able to spend quality time with my brother in law, my niece and my sister - who promised me Memphis-style barbecue from Max's for dinner. On occasion I can be rented cheap. I arrived at my sister's house late morning and quickly got the run-down: the Bike Rodeo was at the High School about a half mile away. My sister said she needed to take her car because she and a lot to carry. When someone says to me - especially during National Bike Month - that 'we have to take the car' there is no other way for me to interpret it other than a dare. My Park Tool work stand, pump and a couple of toolboxes nestled gently but firmly in the trailer (which I converted from the Bike Walk Connecticut/Bike Carrier Configuration to traditional cargo mode the evening before) and so did my sister's three folding chairs, a sign that read 'RESTROOMS' with an arrow pointing (people will want to know where the bathroom is, she explained) and two plastic containers filled with cupcakes. My sister is a Girl Scout Troop leader. I figured cupcakes would be involved somehow. With the trailer working smoothly, we all pedaled into the parking lot of the Red Hook High School well before the 1:00pm start. I had plenty of time to set up and I didn't need it. Since I wasn't sure I'd have access to a shady tree, I packed along an umbrella my wife has used to stay cool while sketching. The metal bracket I welded for her was placed on a taller tripod so I could stand up easily underneath and any bike I'd be working on wouldn't be in the way. Others arrived to set up the obstacle course, water and lemonade table, and the helmet safety station. And then: this arrived. 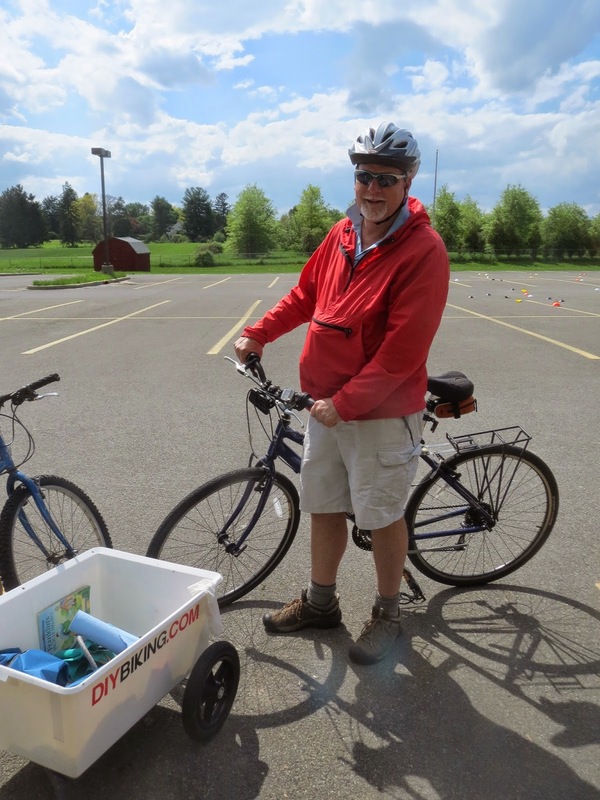 It was a van from Kingston Cyclery, and the driver, Bob, was at the bike rodeo for the same reason I was: to volunteer to tune bikes. Kingston Cyclery set up right next to me and projected their authority with a recognized name in the community, proven expertise, and a bright red van. I projected my authority with an apron (not for nothing: but if you put on an apron and stand next to a Park Tool work stand in a public place, people on bikes will come from miles around). Also, not to humble brag, but my setup with the tiny bike trailer and my umbrella was better than his. All of my tools were at the ready - if you're gonna bring a van, park it the other way so your workstation is on the same side as the sliding side door! - and, even more important, I was closer to the water and lemonade table. Still, I was happy Bob from Kingston Cyclery was there. Not only did I have someone to talk to who was alive at the time 'The Goonies' hit theaters, but there were so many people attending he and I were working on bikes almost constantly and the kids didn't have to wait too long to get their bikes back. 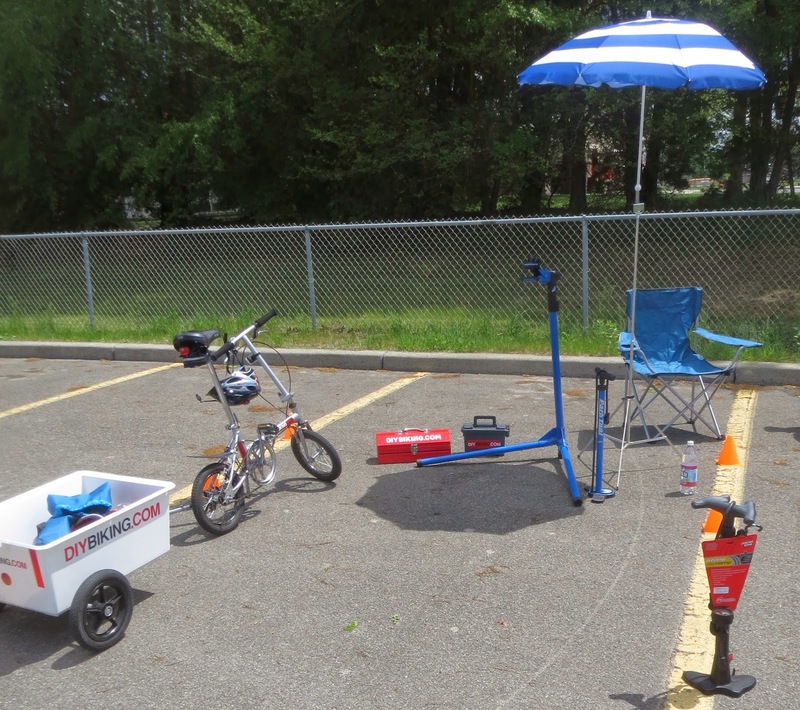 The work we were doing was simple: make sure the brakes, wheels and tires, and quick releases were in good shape before the kids could ride their bikes on the obstacle course. We tuned occasional adult bikes as well. Most of the work involved had to do with the fact that a lot of the bikes appeared were pulled from basement hibernation that very morning. Tires were low, spiderwebs were plentiful, and brake cables had stretched - which means when one squeezes a brake, the handle has to go almost all the way to the handlebar before anything happens. As a bonus, I brought along some cable ends, so if a bike featured a frayed cable I'd snip it a bit shorter and fit one to the end to give the bike a tidy appearance. Another thing we needed to do was make sure the bikes fit the rider properly. A little-known fact about kids is they grow, which means each season of riding on the same bike brings about a few turns of a spanner to raise a seat or pivot brake levers downward so their wrists wouldn't be bent while riding (something to know for adult bikes as well: keep your wrists straight for the most comfort). A lot of the bikes, as I learned, were hand-me-downs from older siblings - some of them seemed eager to offer tips on cycling on the obstacle course. A treat of this event was the arrival of the mayor of Red Hook - Ed Blundell. I smiled because just the day before I got to go on a bike ride with my mayor: David Martin, who had just been given a bike by the Stamford Downtown Special Services District. Stamford has a population of about 130,000. Red Hook village has a population of 1,920 - but they need a cycling mayor just as much as any town or city. And I got to possibly become the first person in the blogosphere to take a picture of a mayor in a bike helmet two days in a row. Like the day before, this mayor gave a nice address about the value of cycling to an enthusiastic crowd. His, Kingston Cyclery's and Girl Scout Troop #10201's enthusiasm for cycling were definitely a big part of why the event was working so well. After the address, I kept working on bikes. I wasn't stumped too badly by anything (save for the Bard College student who desperately needs her back wheel straightened) and deep down was thankful the Red Hook Police and the organizers were making everyone sign a waiver of some kind. A couple of fixes stood out, such as the woman whose rear rack rattled badly. It wasn't hard to figure out why. I usually give bonus points for creative fixes, but not when the bike is actually equipped with mounting points for racks (and these are clearly visible). I fixed it quickly and got rid of the rattle. I had to repair the rear rack of another bike, too. While the girl and her parents stood watching, I bent myself over the bike rather awkwardly which slightly smushed the passenger (I forget the passenger's name). One of the parents suggested we move the passenger, so I quickly changed my posture so they rack wouldn't rub against the back wheel and the passenger would be comfortable. From time to time, I got a question I wasn't comfortable answering. For instance, a little boy of about six kept playing with my Park Tool pump (I'd usually use the work stand I brought but if the child showed interest in watching what I was doing I'd sit on my toolbox and showed them what the problems on their bike were) while I was working on his brakes and asked "Doesn't this sound like someone farting?" referring to the sound the air makes when it leaves the nozzle. I carefully told him it sounded at first like his tire was losing air, and, since he showed an interest, I allowed him to try to pump his own tire. It was around this time I grew an even greater appreciation for Kingston Cyclery and other local bike shops: there definitely is a customer service skill one has to have. After several minutes of working on this kid's bike, I asked him to hop back on it so I could see how much higher to raise the seat. Then I had to ask him to get off the bike again. I wasn't expecting that response. "Because I don't want to keep calling you, 'you.'" I said. The six-year-old was having none of it: "I don't want to give it to you," he said. "Because if…you might work for an evil organization, and if you work for an evil organization you might be able to find me where I live." I glanced over at the kid's mom, but she was laughing (possibly at me, possibly at something else). I wasn't sure how to respond. What evil organizations do you know? Any of them have an underground lair with bike parking? Are any of them looking for a communications director? Instead, I politely replied: "I can only assure you that I don't work for an evil organization. Can you just get off your bike so I can fix the seat?" By the end of the afternoon I had lost count of the number of bikes I had worked on and the number of times I had to move my umbrella so the shade could stay over me. Everyone was having fun, and every time I'd turn to my sister and use the word lemonade as a verb (present tense) she'd bring me a cup. Shortly after four, we packed everything up and rode back home. I changed my shirt and my sister fulfilled her promise by taking me out to Max's for dinner. I thanked her and left, returning to my home city of Stamford by about 9:00pm. 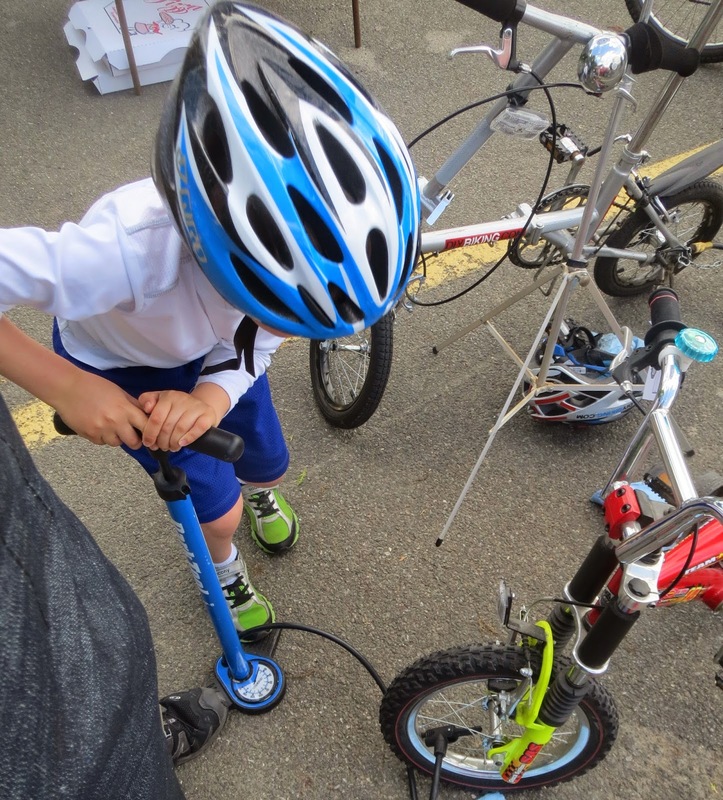 Overall, I found my experience as a volunteer Bike Guru at the Village of Red Hook's Bike Rodeo a fun one. The adults and kids had a great time and between the helmet fittings and the bike tune ups, everyone was ready for the Tour de Red Hook (which is what it sounds like) the next day. If your town, no matter the size, wants to have a bike rodeo too, I urge you to follow the example of the one-stoplight town of Red Hook New York and have one. You'll be glad you did. And if you live in Red Hook and need a new bike or an old one tuned up, visit Kingston Cyclery's new location in town just across from Holy Cow Ice Cream. Everyone knows where that is. Thanks for reading and thanks for riding.